We also invite you to watch our videos on the OSRTS YouTube Channel here. Providing activities and lessons that teach the knowledge and skills necessary to be safe road users is an important step in a Safe Routes to School program. Children learn best when presented with a combination of educational methods such as group activities, hands-on skill building and discussion. Practical, on-going and going age appropriate experience is important! See below and choose the topic you are interested in. Keep your Eyes and Ears Open! And use them to look and listen in ALL directions as you complete crossing. Be visible. Wear bright clothing, or add reflective material or a blinking light to your jacket or backpack. When available, use sidewalks and crosswalks with traffic lights/ signals; wait for a walk signal/ green light for your turn to cross the street. Assemblies grab students’ attention through fun, interactive activities, such as games, skits, or demonstrations. Pedestrian assemblies often promote safety and encourage participation in an event. A game show format covering safety questions makes a good format for a smaller group such as a single classroom or lunchroom chats. 1. Introduction: who you are, what you'll be taking about, why it's important. Polite: Be aware and respectful of others around you on and off the road. Alert: Keep your eyes and ears open, always look ALL WAYS before and while crossing the road. 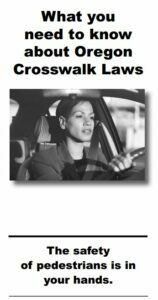 Legal: Obey signs, signals and your crossing guard. Safe: Be sure to make sure you leave with plenty of time to get to school. Walk with others and teach others to be as safe as you are! 4. Summarize: event day is......, who are we going to going to have fun- Be PALS! We suggest using Lesson One of Neighborhood Navigators. 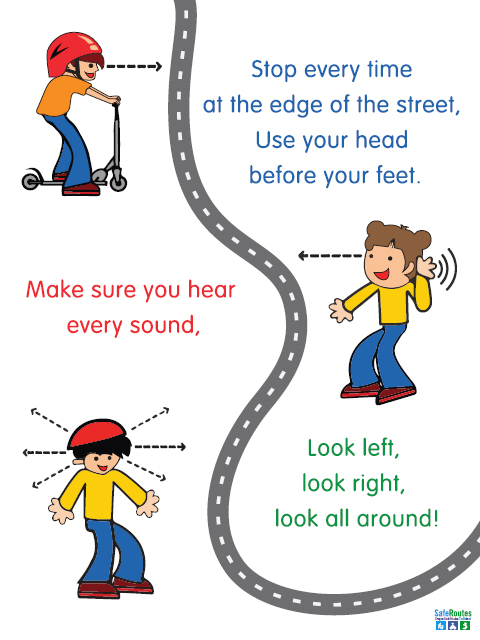 Using the groundsheet or other "intersection" created in classroom or gym, the lesson walks through travel options, required vocabulary, responsible crossing steps, roles of other road users and an opportunity for students to practice. This lesson is best for kindergarten - grade 2 students. Combining this with an outside session is best to ensure students get outside experience. define basic rules of being a safe pedestrian. identify and demonstrate the steps necessary to cross the road safely. 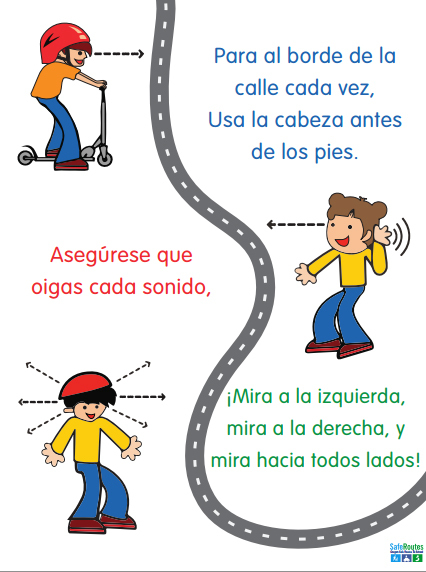 We suggest using Lesson One and Two of Neighborhood Navigators and is best for kindergarten - grade 3 students. 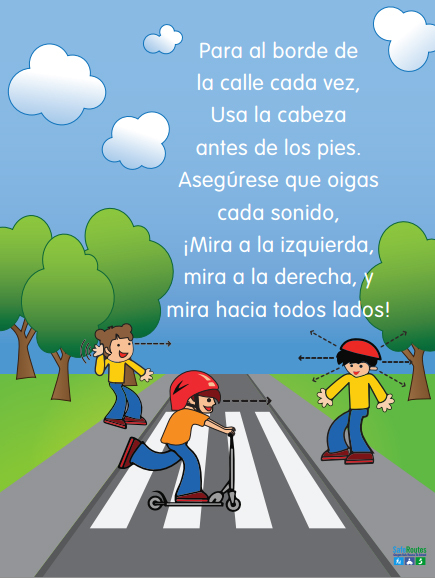 The first lesson walks through travel options, required vocabulary, responsible crossing steps, roles of other road users and an opportunity for students to practice. The next lesson is an outside session where students get realistic practice and experience. The Neighborhood Navigators curriculum focuses on safe, efficient and healthy transportation choices, pedestrian safety, community and neighborhood design, and was developed for Oregon’s Safe Routes to School Program. Neighborhood Navigators is divided into grade level groups and are aligned with Oregon Education Standards for the appropriate grade, and many of the lessons meet other subject standards, as shown at the beginning of each section. Neighborhood Navigators for primary or K-3 grades focuses on pedestrian safety, traffic systems safety and actual practice. As students experience the Neighborhood Navigators curriculum, they will gain a basic understanding of their roles and responsibilities as safe and respected pedestrians. Corvallis School District SRTS programs offers the Neighborhood Navigators Pedestrian Safety program in grade two. Below is a snapshot of the five lesson program. Neighborhood Navigators for grades 4-5 focuses on the roles and responsibilities of being active participants in the transportation system. Students map and experience their neighborhood transportation system as they learn about options available to make it safer. In addition to pedestrian safety, this age of students may be well suited to on-road bike safety education programs. Neighborhood Navigators for grades 6-8 explores how our travel mode choices affect the environment. The following lessons examine how our history of travel affects our choices and habits today. Teachers who have pilot-tested this curriculum have expanded some lessons into two and three sessions. Please feel free to adapt to suit your and your students’ needs and interests. Riding a bicycle is a major step towards independence and mobility. Riding a bike, like walking, is a skill that takes years to perfect, but can be done safely with on-going, age-appropriate education. Often bike skills start in a driveway learning to balance, and progress through skills like starting, stopping, straight line riding, shoulder checks, road rules, navigating intersections and neighborhood riding. Obey all traffic rules and signs--always give proper hand signals. Always ride with traffic, in single file. Be prepared for traffic and pedestrians at cross streets, driveways and parking spaces. And be sure bikes are checked for safety before every ride. Click here for video showing how it's done. Assemblies grab students’ attention through fun, interactive activities, such as games, skits, or demonstrations. 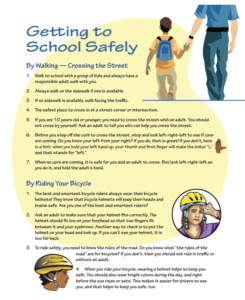 Safe Routes to School assemblies often promote pedestrian and/or bicycle safety and encourage participation in an event. A game show format covering safety questions makes a good format for a smaller group such as a single classroom or lunchroom chats. 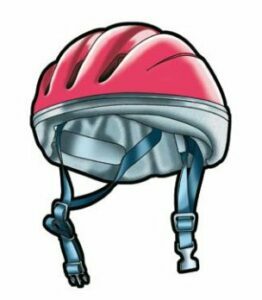 Legal: Wear your helmet, obey signs, signals and your crossing guard. Lights.Safety Gear. Safe: Be sure to make sure you and your bike are safe and ready to go: bike check, attitude check. Walk or bike with others and teach others to be as safe as you are! At Juniper Elementary in Bend we had a short lesson with the student leadership team and asked them to create an assembly presentation for their peers. Learning occurred throughout the school community! Bike rodeos are a great way to raise awareness and excitement and may introduce participants to skills they need, but on-going, age appropriate practice is necessary to become proficient bike riders. A bike rodeo can give participants basic skills so they can continue to practice to become better riders. A rodeo event is only simulating traffic situations, being a competent and confident bicycle rider takes years of age appropriate learning and practice. A typical rodeo is best suited for new riders up to 8 years old depending on your choice of stations that usually includes both safety checks and a skills set. The size and scope of the event all depends on the space and resources available. It can be as simple as a few stations in the school parking lot: any safety skill learned is valuable! When learning how to ride, getting skills in a controlled setting is important. To become a skilled bike rider, one must take those skills out on the roads to practice and experience them first hand. The more time on the road the better! The Insurance Corporation of British Columbia developed a six lesson (45 minute each) program that starts with classroom lessons and skill drills on campus, ending with off campus intersection practice and a neighborhood ride. Instructors with little or no background can assist children ages seven to 13 to learn safe-cycling skills that convert into the habits of a lifetime. The sessions outlined are based on solid learning principles and curriculum learning outcomes. They emphasize active participation of the learner, appropriate hands-on experiences, a variety of activity and learning options, and individual and group activities. It takes years of experience to become a skilled bike rider, and to be skilled on one setting, like your neighborhood, could be very different from being skilled enough to ride across town. The only way to get the skills and confidence is through practice and experience. Safe Routes for Kids is one program that does offer in class learning and on road practice. The goal of this program is to teach 4th-7th grade students to travel safely on a bicycle. Students learn the traffic rules and regulations, the potential hazards to travelling and handling skills needed to cycle effectively, appropriately and safely through their community. In addition to the brochures and curriculum we shared, we have assembled videos to help teachers, parents and other educators teach the skills necessary for everyone to be safe and confident road users. See below and choose the topic you are interested in. Our Bicycle Education Videos demonstrate how to do the skills needed to be safe and confident bicycle riders. These go hand in hand with our recommended curriculum. Please see Curriculum and Activities for detailed lessons and plans. 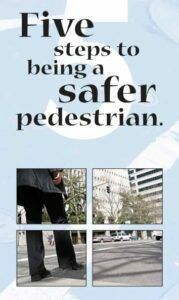 FHWA's Safer Journey Pedestrian Education Videos help educators, parents and others who care about pedestrian safety to get the conversation started with children and youth. 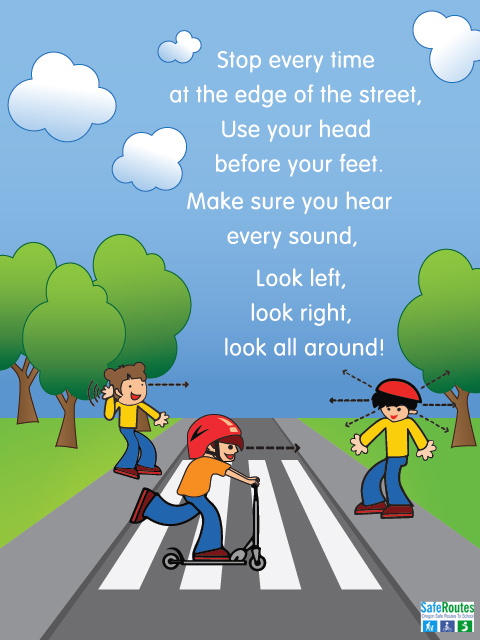 Their three videos — one for each of three age groups — accompanied by a quiz or discussion and an educator's resource library, can be used as an introduction to pedestrian safety skills or to augment our curriculum, Neighborhood Navigators. Please see Curriculum and Activities for detailed lessons and plans. 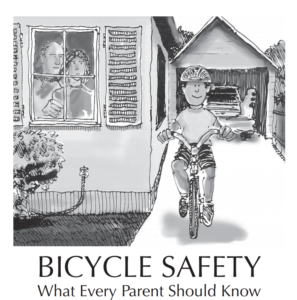 In addition to the videos and curriculum we shared, ODOT has created many posters and brochures to help parents and other educators teach the knowledge and skills necessary for everyone to be safe and confident road users. See below and choose the topic you are interested in to see a sample of the brochures and posters available. Here's a sample of our favorite Bicycle Education brochures and posters. Here's a sample of our favorite Pedestrian Education brochures and posters. Click on any of these links to download the PDF. Check out our recent webinar “Striving for A+ Parking: Introducing a New Tool to Grade Your Schools Bike Parking” brought to us by Shane McRhodes, Emma Newman and Isaac Meyer from Eugene and Springfield. Pupil Transportation section at the Oregon Department of Education has resources and training options available for both adult crossing guards and student safety patrol. Also check out this video produced by ODE. NEW! 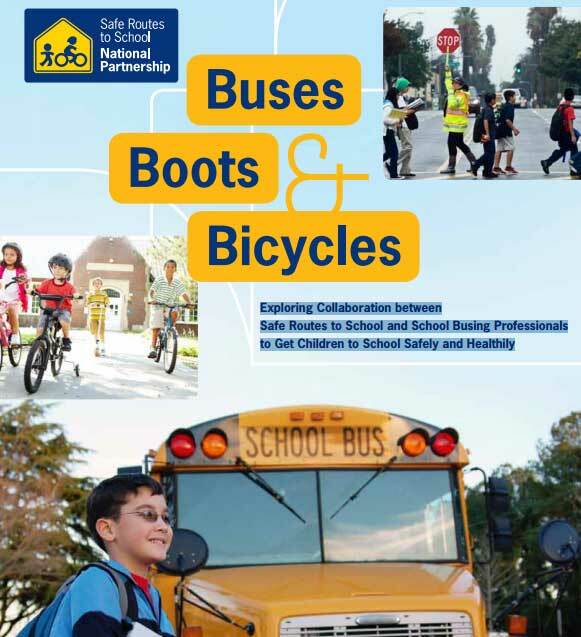 Safe Routes to School National Partnership Report: Buses, Boots and Bikes: Exploring Collaboration between Safe Routes to School and School Busing Professionals to Get Children to School Safely and Healthily, has many resources to consider. The Eugene Springfield Safe Routes to School Program has developed a Bike Parking Assessment Tool to assess bike parking facilities at one school or to compare and contrast the quantity and quality of bike parking facilities at different schools. You can read and download the full Eugene-Springfield Bike Parking Report here. Back to school means more children walking and biking on our roads. It’s exciting and fun, but there’s one thing that all families should add to their lists as they prepare for back to school – the trip to school. Now is the perfect time to plan for and practice getting to and from school safely. Whether your children walk, bike, ride the bus, or ride in a car, a little planning and preparation can go a long way towards keeping children safe. Practice and discuss these safety tips as a family and be a great example by always practicing how to travel safely with your child. Check your route to school, and practise. When possible, choose streets with low traffic volumes, slow speeds, few intersections, good bicycle lanes and good sidewalks with no roadway construction.